As a response to the disaster at the Fukushima nuclear power plant I've heard the claim that fossil-fuel power plants using coal release more radiation than a nuclear power plant. I searched for some information and found an article supporting this statement in the Scientific American called Coal Ash Is More Radioactive than Nuclear Waste. This is a topic with huge political and economic interests which makes accurate and reliable information hard to find. I'm now wondering if that comparison of coal ash and nuclear waste is accurate, and also if it is misleading, how it compares to the real-world radiation release. How much radiation is released by coal and nuclear power plants in regular operation? 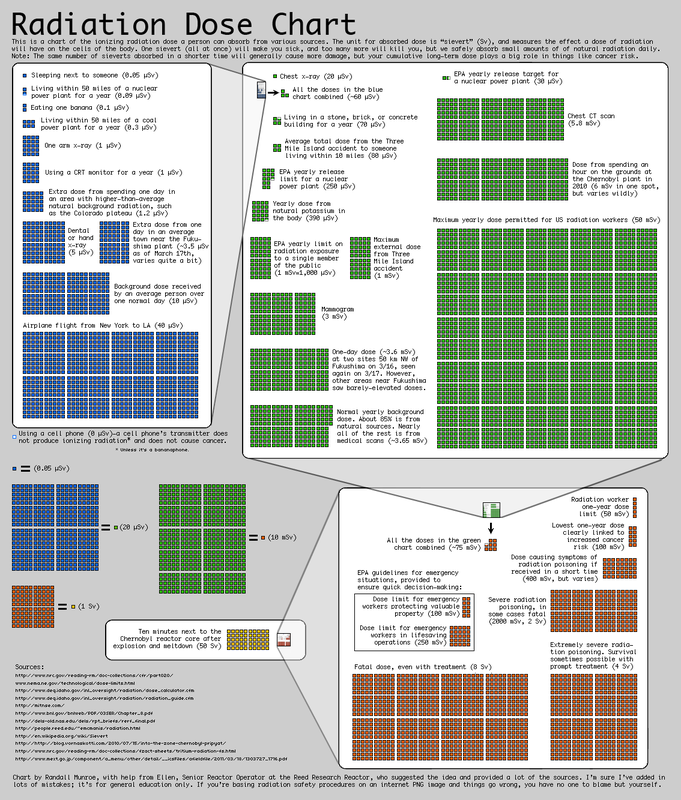 How do the numbers compare if you include different types of nuclear accidents? Radiation doses from airborne effluents of model coal-fired and nuclear power plants (1000 megawatts electric) are compared. Assuming a 1 percent ash release to the atmosphere (Environmental Protection Agency regulation) and 1 part per million of uranium and 2 parts per million of thorium in the coal (approximately the U.S. average), population doses from the coal plant are typically higher than those from pressurized-water or boiling-water reactors that meet government regulations. Higher radionuclide contents and ash releases are common and would result in increased doses from the coal plant. The study does not assess the impact of non-radiological pollutants or the total radiological impacts of a coal versus a nuclear economy. So it is clear that a single nuclear accident widely offsets any "gains" obtained by using a nuclear plant instead of a coal plant. Thanks to Borror0 for the great find. To put things in perspective see the following infograph. At the top left, in blue, you can see the radiations absorbed by living next to a (nuclear|coal) plant. In yellow, the radiation doses of Chernobyl - many orders of magnitude higher. 136 person-rem/year for the complete nuclear fuel cycle. US produces "a total of about 2,000 - 2,300 metric tons of used fuel per year"
"produces 1179 tonnes of nuclear waste per year"
"has 58 nuclear reactors ... supplying over 430 billion kWh per year"
So, for a given amount of energy, the tiny fraction of uranium/thorium in the ash created by coal power plants is similar in mass to the total amount of radioactive waste produced by nuclear plants, which is mostly uranium. I don't know how much of this is stored in ash ponds vs dumped into the atmosphere, but it's certainly not held to the same standards as nuclear power plant waste. Although the concentration of uranium and thorium in coal is extremely low, a typical 1000 MW coal fired plant burns about 4 million tons of coal every year. This results in an unregulated release to the environment of 5.2 tons of uranium along with 12.8 tons of thorium from a single coal plant each year. This does not include the large amounts of radium, radon, polonium and potassium-40 that is also released from coal plants. Please refer to the Oak Ridge National Laboratory article Coal Combustion: Nuclear Resource or Danger by Alex Gabbard for more information on this subject. Nuclear power plants are owned by electric utilities which also run coal fired plants, and it is not in their best interest to point out the fact that radiological releases from coal plants exceed those from nuclear plants. Not the answer you're looking for? Browse other questions tagged environment radiation nuclear-energy fossil-fuel .